While visiting Julio, (my friend of more decades than I care to admit) at his house in Florida some dozen years ago, I found in the guest bedroom—a room that vaguely resemble a monk’s cell if you don’t count the opulent bedspread and plush mattress—a single book with browning pages. It bore this intriguing title: “The Incorruptibles”. While it sounded like a 1950’s movie starring a gang of teens, it turned out to be a captivating account of many Catholic saints whose bodies were documented to have been found intact years or centuries after their death. I stayed up late into the wee hours, reading the somewhat grisly details of various body parts or even whole bodies in inexplicable states of preservation; no mummification required. Julio has a gift for such bon mots. The phrase made me laugh aloud, and it stuck. As it turns out, the two of us did chase saints across Italy, or as we later joked, Padre Pio chased us across Italy. In years after, we went on to chase saints halfway round the globe. When I was growing up as a Jewish girl in the Bronx, in a secular Yiddishist environment, such a notion as saints would bring puzzled laughter. I remember my mom making humorous comments from time to time, like: “It’s the building next to that church, you know: ‘Our Lady of Ten Thousand Mitzvahs.’ ” In a largely agnostic/secular/atheist environment, the idea of devotions to deceased mortals and their representative statues was an inexplicable phenomenon of a culture diametrically opposed to our own. It took many years of study and experience for me to begin to understand the world’s attraction to saints, and my own as well. The first big piece of news for me was that those regarded as saints are found in every faith, and devotion to them is not limited to Catholicism. There are even those who could rightly be regarded as secular saints. The second was that there are among us today many who by any regard fit that description. I’m fortunate enough to have been in the presence of some of the greatest of our time. It’s been my encounters with the living ones that gave me the understanding of the intense devotion to those who no longer walk the earth. 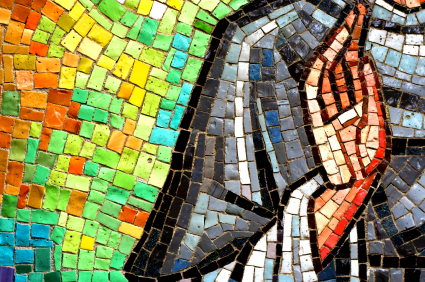 So, I think for a while, I am going to run a periodic series of reflections on sainthood; what it means for us in this era, and some of my personal experiences with those whom we may hold in this regard. I have meditated on the subject of sainthood many times since this experience, and I find a bit of wisdom in understanding that saints are people who suffer the projection of unlived holiness from a group of people and are made to serve in this strange role whether they like it or not. It is only the other side of the coin of scapegoating, in which a group chooses an individual to carry the dark side of their own personalities, which they are unwilling to own for themselves. This idea has been borne out by careful examination: every group I have ever experienced has done this living-out-by-appointment of the human elements that are too good or too bad for an ordinary person to accommodate in his or her own life. The group gives that overwhelming characteristic to some person nearby. God help the poor person who is landed with either of the excesses that humankind finds equally difficult to bear. This entry was posted in Masters, Memoir, Saints Alive!, Spiritual Reflections, Stories from the Journey and tagged Italy, Padre Pio, Robert A Johnson, Ron Roth, sainthood, saints, spiritual. Lots of Gems in Past Posts! Read some! Add Me to Your Facebook Pages!